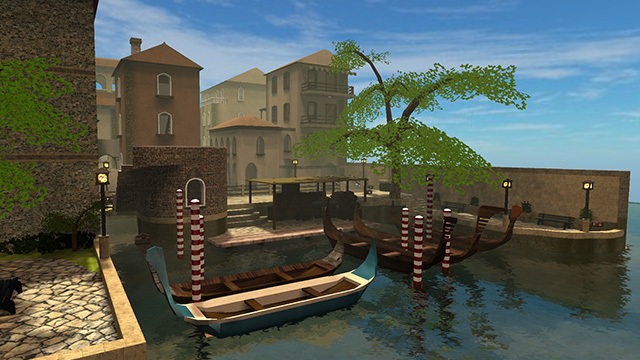 I made a remake of GARCiA's famous venice. I tried to avoid any changes affecting the gameplay and gameflow. For that I tried to keep the height of railings, the height of the bridges and stuff like that. Since venice was successful the way it was, I also kept windows not accessible, all kind of things you get stucked on etc., although many suggested changing things. The only area I modified is the big pier, I made the roof of the small building accessible and added some goods along the pier. I started doing was noclipping doorframes but then I got unsure. Would players like to have the doorframes noclipped? Would they like to have anything changed at all concerning clipping? Thanks SomeDude for bug fixing and help. We added new waypoints for bots. So the noobs don't notice the difference when they play but the map doesn't look like it's from 2004 anymore. The map is succesfull and played the way it is, so I did not want to risk changing anything that would affect the gameplay. Very smart idea not to change the layout too much as it is the most successful map in the game. After seeing the video, I noticed the contrast within the lighting is nearly none compared to it's original. This makes the lighting feel pretty unnatural. Although you've stated the gameplay and flow aren't a priority, I still suggest to add (way) more playerstarts. Man this really came out nice. I agree with Sui's points though, the lighting could look a lot nicer with some attention to it. Some places seems very plain and unnatural indeed. I also agree that more playerstarts would be beneficial. Keeping the layout and flow as close to the original as possible is great and keeps the regular players of the map happy, but at least a few more playerstarts would really improve the gameplay while not changing it too much. I added 11 additional playerstarts and made the lighting more interesting, more yellowish and reduced ambient to have more contrast. Thx crap_I'm_dead for error spotting. Please change the license of this map, unless you've made it all from scratch.